— Major Antonio Silva, aboard UNSC Pillar of Autumn. The Orbital Drop Shock Troopers (ODST) are a special operations capable organization of the UNSC Marine Corps that specialize in orbital-dropped shock infantry and special warfare tactics. The ODSTs are one of the primary Special Operations units of the United Nations Space Command, and is under the supervision of Naval Special Warfare Command. 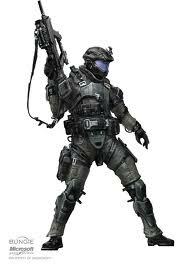 The Orbital Drop Shock Troopers are one of many Special Operations Forces in the UNSC Defense Force. The ODSTs are under the exclusive operational authority of the Naval Special Warfare Command/Naval Special Weapons. Their methods of operation allow them to conduct missions against targets that more conventional forces cannot approach undetected. ODSTs are recruited from the Special Operations Groups of every nation of the Unified Earth Government and are a strictly all volunteer fighting force. Potential ODSTs are selected because of their performance in their chosen MOS; every ODST candidate is a veteran from another Special Operations outfit and therefore has already gone through at least two layers of screening and months of intense training — not counting the years of training received before volunteering for the ODSTs. There are no age or gender restrictions — as long as the candidate meets the physical and mental requirements they are guaranteed the opportunity to try out for the ODSTs. Once in the ODSTs, a candidate’s training continues – its entrance requirements serve as a third layer of screening upon two more, where applicants would have theoretically failed to pass. Candidates would, therefore, already have extensive experience in conducting the types of high-risk missions that the Orbital Drop Shock Troopers typically perform. ombat team also consists of ten to fourteen operators, each of whom has a specific function on the team. ODSTs are known for their unusual methods of insertion, dropping from orbit onto terrestrial environments. Similar to their ground-based counterparts, the ODSTs maintain units of varying strength aboard many UNSC vessels and Installations. Deep Ground Surveillance or Long Range Reconnaissance: Patrols in small groups, in uniform, usually far behind the enemy lines. While DGS units may direct air or artillery strikes against enemy positions, they strive to be unobserved, and have only self-defense, not DA, capability. Groups engaging in surveillance deep behind enemy lines, are commonly known as “Long Range Reconnaissance Patrols” or LRRP’s. Direct Action: Short-duration strikes and other small-scale offensive actions conducted as a special operation in hostile, denied, or politically sensitive environments and which employ specialized military capabilities to seize, destroy, capture, exploit, recover, or damage designated targets. Direct action differs from conventional offensive actions in the level of physical and political risk, operational techniques, and the degree of discriminate and precise use of force to achieve specific objectives. ODST’s in the back of a pelican. The idea of inserting highly trained troops behind enemy lines from high altitudes has its roots in the paratroopers of 20th and 21st century fame, who dropped frequently behind enemy lines to capture strategically important targets in anticipation for a larger advance by more conventional and numerous military forces. Such troops were first used prior to World War II by Italian and Soviet forces, but the first serious application of the doctrine was seen in 1940 by the German Air Force in World War II to overrun the Allied positions in Denmark, the Netherlands and the legendary Eben Emael fortress in Belgium. Paratroops were also used to capture the entire island of Crete. Later, during the Battle of Normandy known as Operation Overlord on June 6, 1944, when two American Airborne Divisions and oneBritish Airborne Division landed behind enemy lines in Normandy, France on D-Day and again in Operation Market Garden. Although they were only marginally successful, they proved the concept of paratroops as useful and effective in large scale warfare. While the concept of dropping human soldiers from orbit had been around since the mid 21st century, the establishment of the UN Marine Corps in 2163, would be the historic first deployment of the future 105th infantry in the Martian Campaignagainst the Neo-Communist Koslovics. The UN Marines historic first drop onto Mars in support of UN led war against the Koslovics and the Frieden forces not only proved the feasibility of such an option, but also the effectiveness of deploying soldiers from orbit. The success of the Argyre Planitia Campaign by the UN, and its participants of the first drop onto martian soil would become the predecessors, or early members, to the modern ODST units. At the conclusion of the Rain Forest Wars and the Jovian Moons campaign, the Orbital Drop Shock Troopers were a fully established force and participated in every high risk operation during those conflicts. However, the conclusion of these conflicts in 2170, along with the signing of the Callisto Treaty and the subsequent years that followed, the ODSTs saw little action as more political, and more important issues such as overpopulation and famine and a massive military with no purpose gripped the postwar nations of Earth. The first major combat re-emergence of the ODSTs occurred in 2490 during the beginnings of the civil conflict between the UEG and the Insurrection. Using the ORIONs as exemplary models, the reputation of the ODSTs, as well as their training, was restored and enhanced as time passes. For the years leading up to 2525, the ODSTs would once again conduct high risk operations against the Insurrectionists, to either stop the enemy before they could carry out attacks against supporters, and officials of the Earth Government or to cut off major suppliers to the Insurrectionists. An ODST of the 46th division in combat. On November 1, 2525, the UNSC moved into a full alert status after the devastating and horrifying first contact with theCovenant at Harvest; this marked a change in objectives for the ODSTs, who up until that point had been fighting theInsurrectionists. As humanity’s military turned to meet the threat of the Covenant, divisions of ODSTs prepared to participate in the most critical engagements in the war and also to conduct the riskiest missions in the history of mankind. 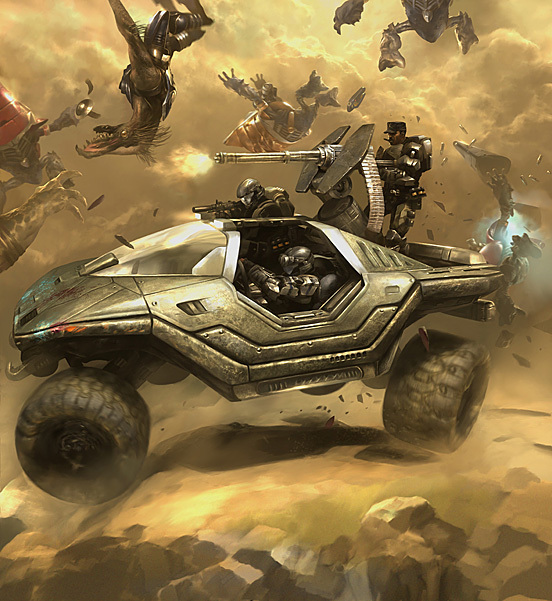 The Battle of Hat Yai marked one of the first deployments of ODSTs against Covenant ground forces; although the planet was lost in the ensuing conflict, fortunately, the ODSTs were successfully extracted before the UNSC retreated. In 2526, ODST’s were dropped onto Circinius IV to assist in the defense of the planet, but all were lost over the course of the battle. Not long after the Harvest Campaign, the ODSTs participated in the Battle of Arcadia where they assisted Marine forces and SPARTAN-II Red Team in defending the capital city from Covenant ground forces, thus allowing the evacuation of the civilian population. Having successfully kept Covenant forces from occupying the city, the Corps began launching multiple assaults on the Covenant’s bases of operations to reclaim the planet. Several ODST battalions joined UNSC Spirit of Fire‘s rescue operation after retaking the planet and soon participated in the Battle of Shield 0459. Following the enactment of the Cole Protocol in 2535, ODST combat teams were tasked with boarding commercial and private vessels and purging their navigation databases. During one of these routine operations, a group of ODSTs aboard UNSC Midsummer Night were captured and taken to The Rubble. They, in conjunction with SPARTAN-II Gray Team, would later defeat a Kig-Yar plan to trick the inhabitants of the Rubble out of their navigation data, which could compromise the location of Earth. As the Covenant-Human war progressed, the ODSTs would go on to participate in many engagements; among these were the Battle of Jericho VII, anassassination mission on Heian, the Battle of Skopje, the Battle of Sigma Octanus IV, the Battle of New Jerusalem, the Battle of Tribute, and the Battle of Ariel. The numerous campaigns and operations in which the ODSTs participated throughout the long war all pale in comparison to the Fall of Reach in 2552, during which countless ODSTs lost their lives defending strategic locations on the planet. During the initial invasion of Reach, a large contingent of 3,200 ODSTs participated in the Battle of Viery, assisting theUNSC Army in repelling the Covenant forces from the planet. Throughout the course of the battle, the UNSC formed joint forces to combat against the overwhelming Covenant forces. Some time during the event, several battalions were stationed on UNSC Pillar of Autumn. As the planet fell to the Covenant onslaught, the vessel made a blind Slipspace jump away from the Epsilon Eridani system, discovering the long-abandoned Installation 04. 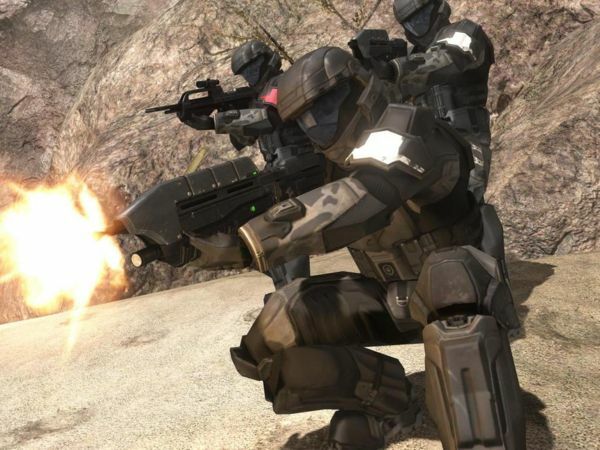 During the Battle of Installation 04, shock troopers led by Major Antonio Silva and First Lieutenant Melissa McKay, operated as a guerrilla force by conducting hit-and-run operations against the forces of the Covenant’s Fleet of Particular Justice. Fresh from the disastrous loss of Reach, the ODSTs participated in the most significant battle of the entire war: the Battle of Earth. The battle began on October 20, 2552, when a smaller-than-expected Covenant fleet led by the Prophet of Regret jumped into the Sol System. 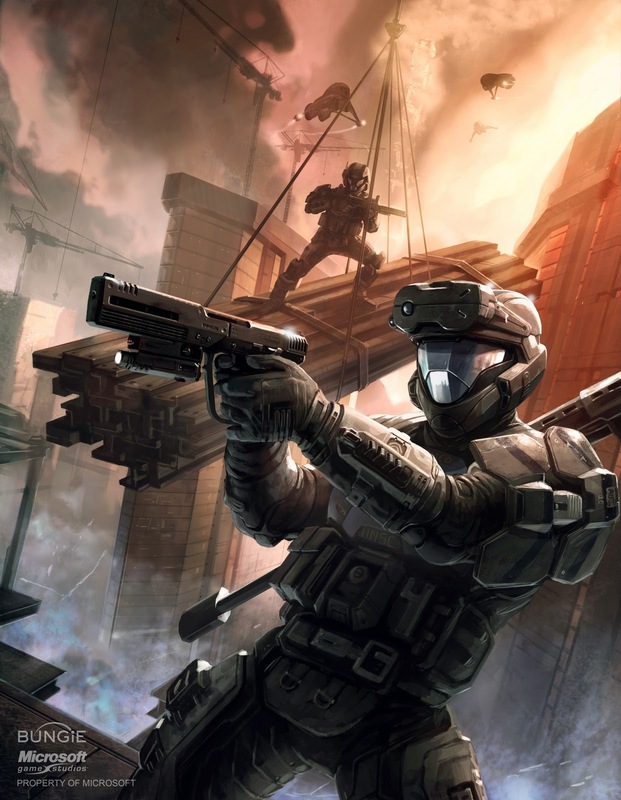 ODST combat teams, along with the Marines, began engaging Covenant forces on the Orbital Defense Platforms Cairo, Athens, and Malta. Despite the ODSTs’ valiant efforts, Malta and Athens were destroyed. As the Covenant ship carrying the Prophet of Regret landed over the African mega-city of Mombasa, teams of ODSTs were deployed over the city from orbit in an attempt to board the carrier; before the teams could reach the target, however, the carrier jumped into Slipspace. Only a single squad managed to safely land in the city to carryout the retrieval of the Superintendent‘s data. After Regret’s unexpected retreat from New Mombasa, members of the 7th Shock Troops Battalion would later drop from UNSC In Amber Clad ontoInstallation 05 during the operation to capture the Prophet of Regret. Most of these troopers would perish during the initial firefights against the Covenant, and only a few would escape back to Earth with Lieutenant Commander Miranda Keyes to lead a resistance against the Covenant occupation forces. Overall, the defense of Earth was one of the largest campaigns the ODSTs fought in during the entire war. The fighting spread across the globe and in space as the Fleet of Furious Redemption and the Prophet of Truth‘s own fleet attacked the remnants of the Orbital Defense Grid. The fleets soon deployed troops throughout the continents of North America, South America, Europe and Asia. The Battle of Cleveland is one example of the ODSTs’ participation during the war on Earth. Two ODSTs from the 2nd Shock Troops Battalion fought alongside a detachment of Marines in the Battle of Pawas. Troopers T. Rymann and S. Hartley were tasked with calculating the crash site of John-117 on Earth, while a Marine battalion was tasked with defending a narrow corridor between Covenant and UNSC forces in Pakistan. Bravo-21 and numerous Marines were killed in the clash, while Bravo-22 was injured along with some of the other surviving Marines. Their actions successfully allowed HIGHCOM to track and locate the Spartan. After the opening of the Artifact in November of 2552, the 11th Marine Force Reconnaissance/ODST, stationed aboardUNSC Forward Unto Dawn, fought alongside John-117, during Operation: BLIND FAITH. Men and women from this battalion were also some of the first humans to travel outside the Milky Way galaxy, during the Battle of Installation 00.One such assault happened during a mission to destroy numerous Covenant Type-27 Anti-Aircraft Cannons overlooking a desert. These AA guns were destroyed by the ODSTs, allowing UNSC Forward Unto Dawn to successfully land near theCartographer building. 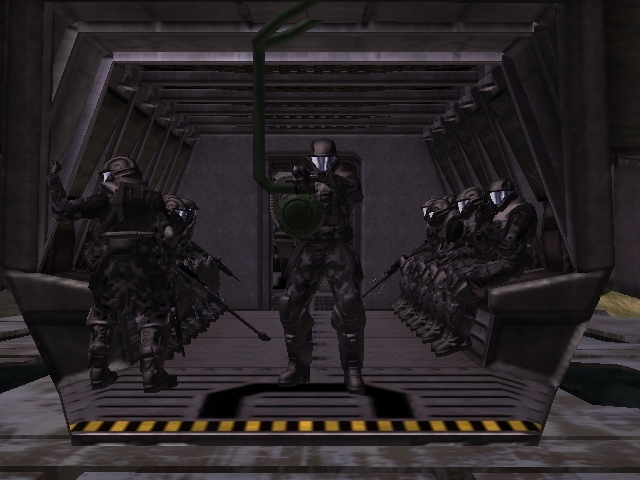 During the last battle of the Ark campaign – the last battle of the war – ODSTs were again airlifted into combat. This time, they punched holes in Covenant armor and artillery positions to allow John-117 and Thel ‘Vadam to eliminate the Prophet of Truth. The ODST Battle Dress Uniform is the signature piece of equipment used by the ODSTs – the armor is vacuum-rated, capable of extravehicular activity for fifteen minutes. The ODST BDU has been in use for well over 50 years by the 105th, and remains untouched by its ability to protect its wearer during the toughest operations. The ODST helmet is standard for Helljumpers. In 2535 the MJOLNIR/AA entered service as a less venerable helmet from the regular ODST Helmet. The Single Occupant Exoatmospheric Insertion Vehicle (abbreviated SOEIV) is a tear-drop shaped pod made of Titanium-A, Lead Foil and coated with ceramic skin. The SOEIV is the signature piece of equipment used by the ODSTs and is known for its risks and intense heat which has garner the ODST nickname Helljumpers. Armed Assault Boats were aircraft used by the UNSC Navy and Marine Corps, to deploy troopers for air assaults. However, the armed assault boats proved to be ineffective, taking heavy fire once within ground firing range and were also very slow. At some point they were replaced by the SOEIV. Due to their Special Operations status, Orbital Drop Shock Troopers are equipped with most of the weaponry used throughout the UNSC, regardless of branch of service. While not given the same level of resources as the SPARTANs, they are able to complete missions considered too dangerous for normal infantry, using whatever weapons that are available. Specialized weaponry used by the ODST are suppressed weapons, primarily the M7S Caseless Submachine Gun and the M6C/SOCOM. The ODSTs were heavily influenced by the novel Starship Troopers. The Orbital Drop Shock Troopers have been referred to by Bungie as a futuristic successor to the American Marine Force Recon and the British Special Air Service. In Halo: Uprising, when the ODSTs drop off the Hornets, they use a sort of cable they keep inside their belt, much like modern day armed forces off of a helicopter. Aboard the carrier UNSC Atlas, John-117 had a confrontational moment with four ODSTs in the ship’s gym. John had removed a pin from the weights at the bench press, and forgot to put it back. The ODSTs walked into the gym and went straight to the bench press. The weights fell and almost crushed one of the soldiers’ feet. A fight ensued and John killed three of the ODSTs and severely injured the other. Ever since then, relations between the Spartans and the ODSTs have been tensed and uneasy. However, this does not seem to stop them from working to their utmost efficiency during the Fall of Reach, Battle of Installation 05 and Battle of Installation 00. The Orbital Drop Shock Troopers are a playable unit in Halo Wars. They are available in a few missions of the Campaign but are only available as the final upgrade for the Marine unit in Skirmish Mode if the player chose Captain Cutter as their hero unit. Interestingly, in some special dialogue cases, ODSTs (particularly the Rookie) are called “imps” by Covenant members similar to how Spartans are known as “demons” among the Covenant. Strangely enough, the ODSTs in Halo: Reach are seen using standard-issue UNSC Army weapons, instead of ones normally used by Marines, the branch that the ODSTs belong to. The reason for this is unknown, though it is most likely for gameplay purposes. An in-continuity explanation could be that the ODSTs borrowed weapons from the army due to lack of supplies or maybe losing their own weapons in battle. Captain Jacob Keyes had an ODST tattoo stenciled into his arm, given to him after he saved the lives of many ODSTs during a routine mission on theFinnegan’s Wake. It is strange that in Halo: Reach, the silver visor has a reference to ODSTs, as the blue visor more accurately replicates them. The shoulder pads of ODSTs in Halo 3 appear slightly different than the ones in Halo 3: ODST. In Halo: Reach the ODSTs follow Army rank structure, and use Army weapons, there is a small likely-hood that there is an Army ODST unit. In the Halo: Combat Evolved Anniversary Firefight level, Installation 04, some ODSTs are found on top of the Forerunner signal tower. Buck in Halo: Reach shares the flashlight attachment on his helmet which all ODSTs have in Halo: Reach. The attachment resembles the one on Mickey’s helmet from Halo 3: ODST. 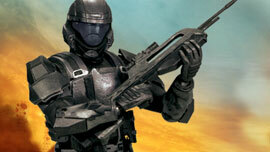 If an ODST is transformed into a Flood Combat Form, their armor will become that of a Marine Battle Dress Uniform. This is because the game engine does not have any code to transform the ODST into an ODST Combat Form.